Designed for IT managers who are looking to formally recognise their work experience. Gain formal recognition of the skills and expertise you've acquired in the workplace. Finish a master’s degree in 12 months, fast-tracked, while you work to apply knowledge sooner. Our Professional Practice degrees enable you to fit study around your busy schedule. Deakin’s Master of Information Technology Leadership is designed for individuals with existing experience and expertise in information technology. The course suits IT managers who are looking for formal recognition of the skills and knowledge they've acquired in the workplace. You’ll learn and engage via FutureLearn, a highly flexible, easy-to-use online learning platform that connects you to experts who are global leaders in their field. attainment of associated Graduate Certificate in Professional Practice. Why study a Master of IT Leadership degree? Deakin's new online Master of IT Leadership stands to have a significant impact on the IT industry by recognising increasingly important soft skills like communication, teamwork or problem solving through a credentialling process. Learn more about this innovative new kind of master's degree in this video. You complete three units and 10 Professional Practice credentials. 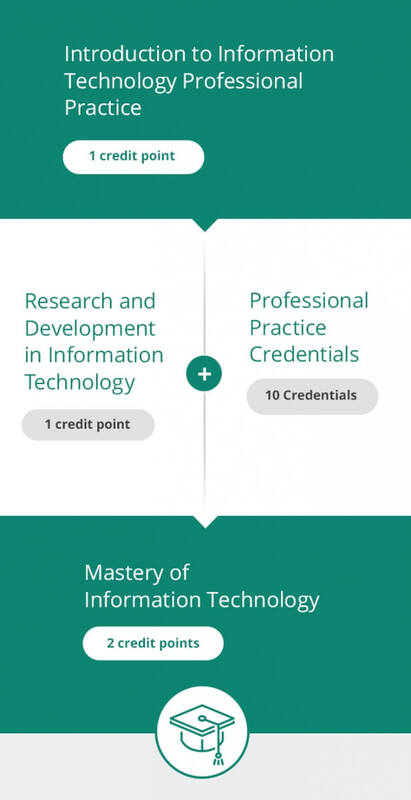 To gain a Professional Practice credential, you'll have to demonstrate the capabilities you've acquired in the workplace. Download the prospectus to find out more about the units and the Professional Practice credentials. Professional Practice credentials are designed to be completed between work and other commitments. You can work on them at any time throughout the year, rather than during a traditional semester or trimester. Each unit below is delivered online and takes approximately 11 weeks to complete in addition to assessment tasks. Please note: As part of any master’s degree at Deakin University, you need to complete the compulsory, zero-credit-point unit Academic Integrity. This unit requires you to pass an online multiple-choice test. Download the prospectus for more details. Our courses cater to busy and accomplished professionals who need as much flexibility as possible to complete their studies. The coursework and assessment is designed specifically for a 100% online experience. You will refine your skills by completing a professional project that demonstrates expertise and contributes to the field of IT management in a meaningful way. Download the prospectus to find out more about the Capstone component. You’ll be supported every step of the way. Each student is provided with a Success Adviser, who provides help and support from enrolment through to graduation. This course has given me and my potential employers visibility into my skills. It independently verified what I know, giving me the edge to get ahead. What is a Professional Practice degree? Deakin's Professional Practice degrees are designed for professionals who want formal recognition of the skills and knowledge they have acquired in the workplace. You will study only a few units as well as complete a series of Professional Practice credentials that are assessed based on proven managerial experience.